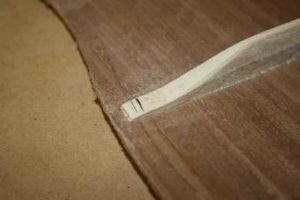 This is How to Make an Acoustic Guitar – Part Twelve – Attaching the Back Plate. 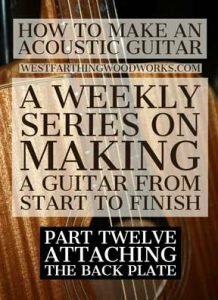 In this part of the series, I’ll show you how to prepare the back plate of the acoustic guitar and attach it to the sides. 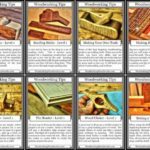 There will also be a lot of good tips along the way. Enjoy. 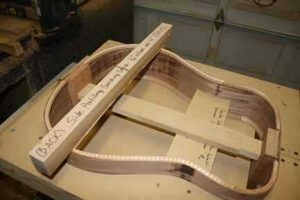 Attaching the back plate on the acoustic guitar is one of the most fun parts of making the guitar, and it’s where you start to see big progress. This is the first time that all of your parts will actually start to look a little bit like an acoustic guitar. It’s a really easy process, and all you need is some time and some patience in order to make it successful. The tools are very simple, and it’s largely an exercise of fitting the plate to the sides so that way it closes perfectly, like a lid. I’ll show you everything that you need in order to be successful, but the one major element that you need to bring his patience. Sometimes fitting the back plate can get a little fussy, but just promise to take your time until it fits correctly. Most of the time, it’s pretty easy to figure out where you are missing. Once you figure that out, you make your adjustments, and then the plate will fit. Don’t worry, relax, it will be OK. The first thing you need to do before you attach the back plate on your acoustic guitar is to inspect it. Especially if you’ve had any time lapse in between making the back and attaching the back, you definitely want to get a good look. 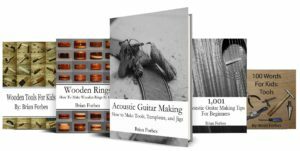 Lots of things can happen to your acoustic guitar during the building process. The main thing that you need to watch out for is movement. This is where the shape that you created on the piece of wood changes due to humidity levels. On the back plate of your guitar, the big thing to look for is that you still have that nice dome shape that you created with the braces. In the wrong conditions, the soundboard can flatten out, or even become concave. Also, double check your glue joints, and the overall look of the braces and the inside portion of the plate. Right now, while it’s not attached to anything is the easiest time to fix any defects. After this, it will be sealed inside the body, and you’re basically stuck with the look. Work on your back plate until you are happy, and then you can move onto the next step. There is one little bit of preparation that you have to do before you can get this process going. 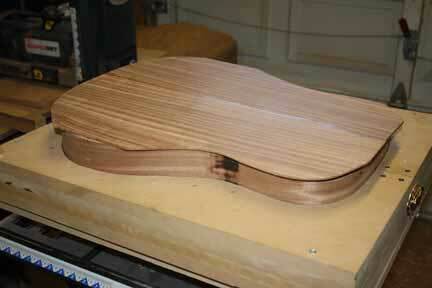 Since the back plate has such a strong arch, you need to sand the top edges of the sides to match that same angle. This is to counteract for the dome shape that you created when you glued the braces to the back plate. If you try to glue the back in this shape directly to the sides in their shape, the two pieces won’t meet flush. This is easiest to do with a large piece of wood that you cut the same arc into and then line was sandpaper. If your braces were a quarter inch of deflection over 16 inches, then create that same profile on a piece of wood that’s maybe 2 inches wide, and at least 20 inches long. Sand the curve so that it’s nice and even, and then line the inside with sandpaper. 80 grit from a sanding belt is perfect for this. 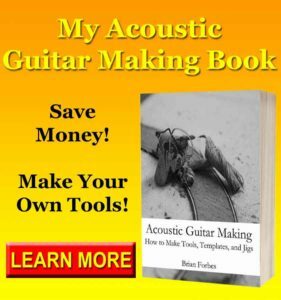 Now you can work the stick up and down the back of the guitar, keeping it perpendicular to the center line and running it from the head black to the tail block. This will sand down the edges of the sides to match the same curve as the back plate. Keep on working the top edges of the sides until the entire surface has sanding marks, then you are done. The majority of the attachment process revolves around aligning the back plate to the sides, and marking out the areas avoid that need to be removed. This is pretty straightforward, but take your time because this will influence the next steps. The better your layout and marking, the easier the fitting process will be. 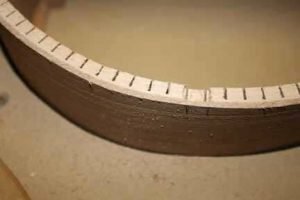 If you do your layout and marking really well, and in the next step you’ll follow that guide when you trim your braces, the plate may end up fitting perfectly on the very first test run. Align your plate so that the center seam lines up with the center line of the sides at the head and tail block. This is very important. The sides are symmetrical if you draw a vertical line through the head block in the tail block. The vertical line that runs at the center of the back plate needs to be congruent with this imaginary vertical line running through your sides. Line up the top and bottom very well, and then apply a clamp on both sides to hold the plate in place. From this position, you can use a pencil to mark where are your back braces meet the outside edge of the sides, and where your center seam overlay meets the head and tail blocks. Mark the braces parallel to the outside of the sides, and mark the center seam right where it would make contact with the head and tail blocks. After the marking is done, it’s time to trim the braces down in order to allow the back plate to seat fully against the side. The reason that I had you mark the braces on the outside of the sides is about to be apparent in just a second. Your sides are uniform thickness all the way around. All you have to do in this case is measure inwards from your marks the same thickness, and the braces will fit inside. This is much easier than trying to jam a pencil in a tight space, and it’s still a very reliable method. There are a couple of different ways of trimming these braces to fit. The fast and easy way is to measure inwards the width of your sides plus your kerfing, and make another mark on your brace. From there, you can cut off the excess with a fret saw, and chisel the way the remainder. At that point you can leave the brace as is, or you can re-scallop the ends to taper back down flush to the back plate. 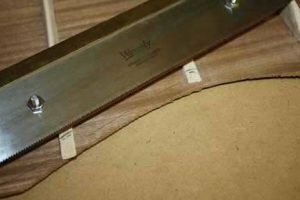 A slightly more involved method of attaching the back plate with regard to how you trim the back braces is to fit them underneath the kerfing. This is a little bit more time-consuming, but it’s generally accepted as a better method. When the ends of the braces run underneath the kerfing, the kerfing in effect helps hold them down. This is an extra layer of protection, in case a glue joint were to separate. In that case, the kerfing will also hold the brace down, which is a double layer of protection. In this case, measure backwards from your initial marks only the thickness of your sides. Then, use a Dremel or a chisel to create notches in the kerfing that allow the back braces to slide underneath perfectly. One way that you can help yourself do this is to trim the ends of the braces down to a uniform height for the last half inch. This height is typically about 1/8 of an inch. Now, when you notch your kerfing to fit the brace, you can evenly notch it at a height of 1/8 of an inch. 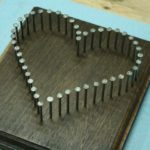 This is easiest with a Dremel Tool. 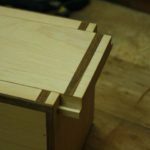 Doing it this way, the tips of the braces will all fit cleanly underneath the kerfing, and you won’t have to worry about creating any type of angled pocket. 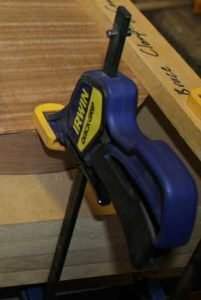 Flat is easy, especially with a chisel, so do yourself a favor and flatten those brace ends first. Once you’ve gotten all your braces cut down, and you either decided to make notches or just terminate the braces before the kerfing, you need to do a comprehensive test fitting. This could also be considered a dry run, because you’re not going to use any glue. I cannot stress the importance of this dry run enough. The moment you just wing it and pour glue all over your guitar, there are going to be seven different areas that need to be trimmed in order to fit the back plate properly. Don’t put yourself in a bad situation. It only takes a few minutes to do the test run, especially if it goes well. If it doesn’t, you’re going to need to spend a little bit of time trimming and fitting, but at least your project isn’t covered with glue while you’re doing it. Do the dry run the exact same way that you would glue on the back plate, just do the entire operation without glue. Clamp the back plate down around the rim, and check for any gaps between the sides in the plate. Gaps mean a bad fit. That’s all that they mean, and there’s no way around it. If you see a gap, that means somewhere near that gap a piece of wood is preventing the back plate and the sides from coming together flush. Find it, and fix it. After your dry run is a success, and only after your dry run is a success, it’s time to start gluing the back plate to the sides permanently. This is where the fun starts, again because the guitar will finally start to feel like a real instrument now that it’s forming. 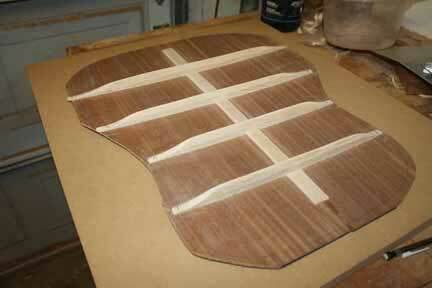 The gluing surface on a guitar is fairly large, and it does take a little bit of time to get all of the glue in place. Make sure you use some assistance tools to help you apply the glue, like a brush or a small roller. 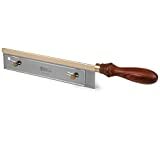 These tools will help you get a layer of glue on the kerfing and the edge of the sides very quickly, which is important. You need the glue to be nice and wet when you attach the back plate in order for it to do its job properly. Apply a nice layer of glue to the kerfing and the edge of the sides all the way around, and the head and tail block surfaces too. Spread it so that way there are no dry spots, and make sure to apply enough without over-doing it. Repeat the process that you used in your dry run to attach the back plate, and clamp it tightly overnight. In the morning, you can remove the clamps and inspect your joint again. If you did everything right, you should have a perfect seal on your back plate. Inspecting your plate and sides before gluing is very important. The fitting is the most important part, don’t move ahead until it’s perfect. 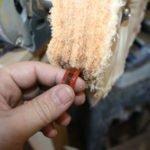 It’s better to notch the braces under the kerfing, and it’s not that much more effort. 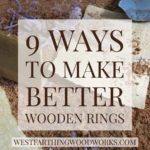 Use a top-quality wood glue that you trust to attach the pieces. Make sure not to apply any clamps in the center of the plate, which will crush the dome. It can take several clamps around the edges of the guitar to hold the plate down. You can use long boards to spread out the clamping pressure. Make sure to allow the glue to cure for 24 hours before removing the clamps. 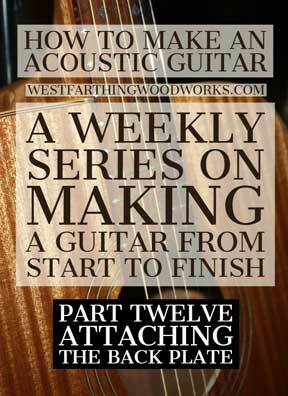 Next week on How to Make an Acoustic Guitar,the series will focus your attention on attaching the top plate. This one is quite a bit more involved than the back plate, but now that you’ve already attached one of them, it will be a little easier than starting with it. The main difference is notching the braces underneath the kerfing, because there are a lot more angles to deal with. I’ll show you some tricks though that can help you minimize your mistakes, and make the process more enjoyable. If you have any questions on the process, or how to attach the back plate, please leave a comment and I’ll be glad to answer them. Happy building.